When attending a play, especially one from such a well-defined genre as murder-mystery, there are certain expectations you can reliably count on – well-defined characters, an intricately woven plot, gradually revealed secrets and lies, and a twist ending you never saw coming. You are likely to find none of these things in Contemporary Theater Company’s most recent production of Whodunit? An Improvised Murder Mystery. What’s more, these absences likely won’t matter. Following (I’m told) a similar format to their previous runs set in the 1940s and the 1960s, this show is set at a dinner party in the late 1980s, and features a wide variety of garish costumes and set pieces to hammer that point home. There was a cigar-chomping senator, a murder-mystery author (conveniently), a blowhard televangelist, a music producer, a Boy George-esque pop star and … a few other lesser-defined characters (at least on this night). The audience is introduced to each character for a few seconds at the very beginning, and then asked to vote for who of them they’d like to be the host or hostess of the central event. And then … the show begins. Telling you what happened in the performance I saw would be entirely beside the point, as nothing said or done is likely ever to be seen again. Suffice to say, conversations were had, intrigues were created, a person was killed and eventually a murderer was unmasked. An exercise in spontaneous storytelling: As I mentioned before, the actors themselves go into each performance knowing only the name and occupation of their characters, as well as the fact that by the end of act one, one of them will be murdered. From there, as the show unfolds, they pair off to have both open and secret conversations, allowing the story to both be created, and evolve, over time. Some of the developments will be important, while others will be overlooked or forgotten; that’s the nature of the format. But there is something unquestionably arresting about having the cast and the audience all driving toward a common end point, without any of them knowing how they are going to get there. A long-form improv performance: There are two types of improvisation: the short-form games you’ve seen on “Whose Line is it Anyway?”, and the more experimental long-form shows where performers are expected to create and expand on stories, characters and themes over time. Whodunit is firmly entrenched in the latter camp, and seen from that lens, there is much to admire about what the performers are attempting on stage. If you watch carefully, you will see a lot of solid technique at play as they give and take focus from each other in order to establish their characters and relationships, throw out suggestions for potential animosities and motives, coalesce as they circle in on who the likeliest victim should be, and ultimately winnow away the various threads to focus in on an ending and resolution. A comedy: The beauty of improv is that, simply through exploring relationships, performers can often find moments of true humor even without searching for them. This production is filled with interactions like this, so comedic moments are certain to follow. In fact, Whodunit has an extra conceit that makes it even more likely to succeed as a comedy. Because of the complexity of the story they’re attempting to create in the moment, certain absurdities are going to arise (in the production I saw, one character blackmailed another to find out the hidden reason a third character was blackmailing the first one, and the secret ending up being … they were once a couple … or something like that.) These moments are funny on their own, but as the performers start to explore the things their characters have said, they themselves begin to recognize how crazy it all sounds, leading to some truly funny and entertaining moments. A murder-mystery: I SUPPOSE you could come to this show simply as a fan of the genre … but then again, maybe not. There are a lot of characters in the show (a necessity for variety and freshness over the course of a run), but it’s almost impossible for you to get a clear sense of who they all are, and since they’re not scripted, some characters just aren’t going to be able to get fleshed out as completely from one night to the next (at the performance I saw, one of the actors kept screwing up the names of two of the characters, which was great for the comedic aspect, but hopelessly confusing for the plot). 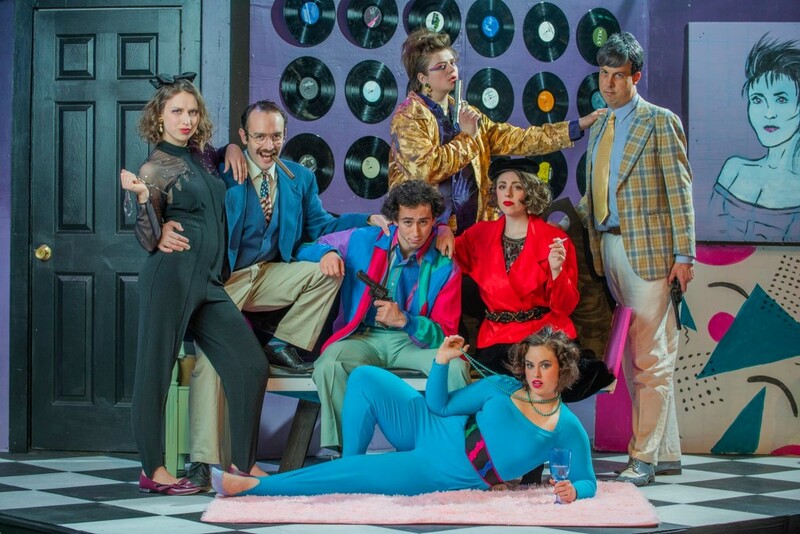 In the end, Whodunit is a theater experience unlike anything else you’re likely to see. I can’t in any way tell you what will happen when you go, but the chances are very good that whatever does occur will add up to a fun night out. Previous post: News Analysis: Is Cancer a Disease of Economics?